I've yet to visit Canada so I eagerly read this beautiful book. Canada's third largest city, Vancouver, was originally a forested shore and the area inhabited by aboriginal people. Forestry, fur trade, fishing, and gold held the greatest attraction for many migrating people. Vancouver was named after one George Vancouver, and the province capital Victoria, was named after the British Queen. It was also the destination of the Canadian Pacific Railway and thus many hotels went up to accommodate new arrivals. This area also boasts the best Canadian climate and there are a number of outdoor activities such as hiking and skiing. The Capilano Suspension Bridge, the longest and highest in the world, is in North Vancouver. With superb scenery, high mountains, water, local native art (totem poles), amazing sea life, and beautiful buildings, and more, Vancouver beckons to be visited. 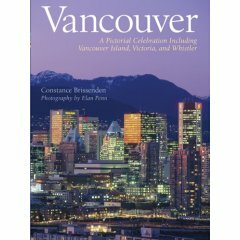 Author Constance Brissenden's history of the area is also very interesting. Reading through this book, you can make notes of places to visit and plot and plan your next vacation. Exquisitely illustrated and I loved the back cover picture. See the other books in this series: Chicago, Las Vegas, San Francisco and Los Angeles. Conclusion - A gorgeous book that would make a great Christmas gift at only $14.95.